Do you sometimes sense things in the moment where no-one else can? Maybe you just powerfully and suddenly *know* something you can’t logically prove – or see something in your mind’s eye, or sense something in your gut about a person or event …that then transpires to be true. You knew that fact with every fibre of your being, but had nothing but your instinct as proof beforehand. You may even be spookily accurate about predicting the gender of a baby to be born, or suddenly feel prompted to go right when you usually go left at a crossroads on your daily travels. I truly believe we are all born with some kind of extra sensory abilities. We are all unique individuals in so many aspects, we all have our own little quirks and peculiar ways – but especially when it comes to psychic and mediumship abilities, we all sense things uniquely. No two people will perceive something the exact same way, be it with our physical world senses of sight, sound, smell, touch and hearing, or with the psychic senses. Now I don’t like labels in spiritual terms, and I really don’t like the word “gifted” – because that implies we can’t enhance what we naturally have and I know from years of teaching psychic ability that we can indeed turn even a little bit of natural ability into more powerful psychic senses with the right expert guidance and practice. Yes, some people are born with tons of natural ability to receive information psychically – like having a 20 foot aerial instead of a little car aerial – but everyone can hone whatever ability they have. 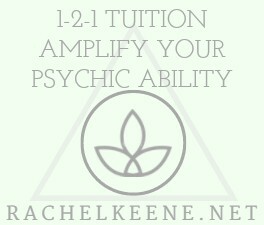 I can help you hone your psychic ability wherever you are at. Classes and circles are OK, but one to one mentoring means you have my full attention. No competition or teacher’s favourites or feeling you aren’t as good as whoever else is in the group. No distractions. No one else holding court and talking for 10 minutes which could be spent learning. I speak from experience, it is how I learned and I know how wonderfully it works. I was encouraged to ask questions whenever I wanted, and I felt really supported and entirely comfortable as I learned. I couldn’t wait for the next session and loved applying what I learned in my own daily practice time. It made me want to absorb as much knowledge as possible and practice as much as I could in between mentoring sessions. It is so much easier to take in information when there is no pressure placed upon yourself and when you feel free to ask anything. I won’t ever make you feel stupid . You can ask me anything and I’ll help you to make sense of your experiences or need to knows. This is how knowledge was passed down by our elders in ancient times and it works for a reason. Being mentored one to one means you feel safe, you never feel like you are being lectured or in a classroom, it’s about being heard, really listened to and nurtured by someone who cares about your uniqueness and tailors your learning to you as an individual. I want to prove to you how great you can become at what you do. So, if you would like to enhance and amplify your natural psychic abilities, just book yourself in for your first session below. Hope to work with you very soon! 1. Click on Book Now below or in the navigation menu and select this service from the list. You will be directed to my online calendar to book your appointment which is also confirmed by email. Appointment times shown are London UK time.